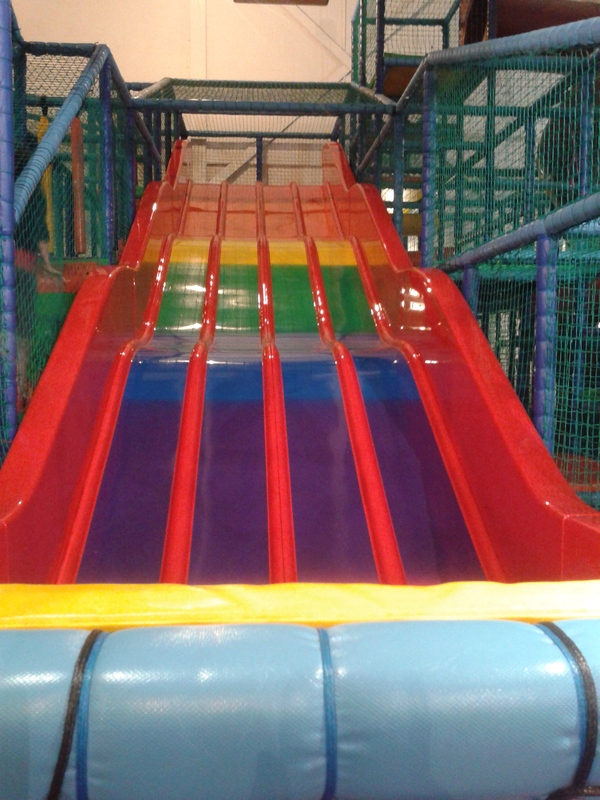 When your little ones have got ants in their pants and need to let all their tremendous wish-I-could-bottle-it energy loose in a place where they can’t damage anything (or themselves), they are in need of a soft play area. Preferably a massive one, where parents can sit and have a coffee while watching their darlings go nuts on trampolines and slides. The Partyman World of Play (3A/3B Grenoble Road, Ozone Leisure Park, OX4 4XP), located right next to the Kassam Stadium, is a gigantic soft play area with themed play sections, an interactive stage, a ball room, private party areas, bumper cars, a two-storey slippy slide, and a toddler area for under-3s. We have visited on several occasions, and the Baberoo has had so much fun she has released all her pent-up energy and exhausted herself so thoroughly she’s fallen asleep on the way home. 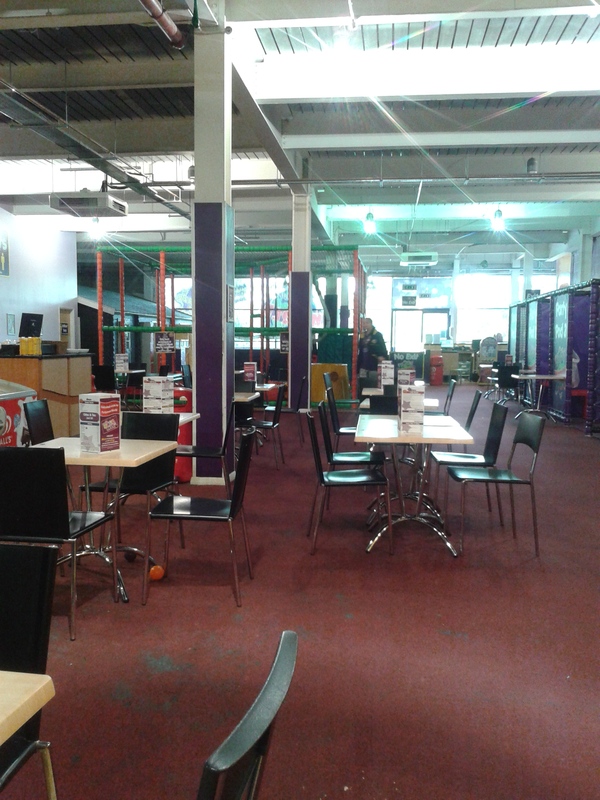 We have always visited on a weekday morning during term time, which means it’s very quiet and there’s plenty of space for kids to run around without waiting to take turns in any of the spaces. I shudder to think what it might be like during weekends or parties – but that’s precisely the advantage of having a child under school age! We can choose to come whenever we like during the week. The disadvantage is that not all of the areas are open. The bumper cars and interactive stage have never been in use when we’ve been there, for example. But the fun of the trampolines, ballroom, and slide are always available, and that’s what the Baberoo gravitates to anyway. To participate, you must pay a one-off fee of £5 to become a member. After that, admission isn’t terribly expensive during non-peak times – babies under age 1 are charged £2, age 1-3 are charged £5, 4-12 year olds are charged £6.95, and adults are free. During peak times prices are higher and adults pay an entry fee as well, but there are also discounts available for booking in advance online, and a range of annual passes or monthly direct debit schemes that make the cost considerably lower if you know your kids love it and want to return several times a month. When you go, especially if it is summer and your kids are in sandals, remember to bring a pair of socks. The play areas are strictly no-shoes-allowed, but you need to wear hosiery of some kind. This includes parents, so remember to bring your own as well. Preferably black ones – otherwise the bottoms of your socks will quickly become black anyway. It must be a huge job to clean all those play structures, and you can imagine all the little hands (and noses) that touch all of the areas soon cause a lot of buildup. Pro tip: apparently Monday evenings are when cleaning happens, so Tuesday mornings are the best time to go. I hope that hasn’t put you off, because it’s a fantastic and safe place to play. We will return whenever the Baberoo’s got a surfeit of energy that is best worked off by climbing up to the super-slide a dozen times. Now, here’s how the Partyman World of Play rates for baby- and toddler-friendliness according to the Oxford Mommy rating scheme. Menu: If you are holding a baby or little one in one arm, you need to be able to eat with only one hand. The menu at Partyman World of Play offers all-day breakfasts, paninis, baguettes, wraps, pizza, jacket potatoes, and a few main meals – nothing out of the ordinary or super-healthy. Not all of them are easily eaten one-handed, although you can probably manage some of them. But chances are your little ones will be having enough fun that hopefully they won’t need to be held unless they are very small. Space: There’s a huge amount of space at Partyman World of Play, which means strollers of every size will fit in the thoroughfares and seating area. You’ll be able to park your buggy at a table without worrying that it’s in anyone’s way. There’s also lots of parking if you come by car. Ambiance: The staff are extremely friendly, which means kids feel like they’re very welcome – which they should be, since it’s a place created just for them. The bright colours are really attractive to young ones, and the variety of activities create a sense of excitement. One of the drawbacks is that the lighting in the areas under the giant slide is very dim indeed, and makes those areas look very dark and much less inviting than some of the other sections, and can make them even feel claustrophobic. Also, you have to be able to accept the faint odour of gymnasium. Facilities: Unfortunately, I can’t say anything good about the toilet facilities at Partyman World of Play. Every time we have been there the bathrooms have been smelly, some of the sinks have been out of order, and there has been water on the floor – not a great ambiance for little ones who are trying to find a dry place to put their potty, or for the ones who are slightly bigger and can use the toilets. There is a baby-changing table in one of the stalls, but it doesn’t have much room in it and the bins have been overflowing whenever we have gone. This particular facility needs to be given more care, because it detracts from the entire experience. Feeding: If you’re a breastfeeding mother, the seating area is fine for breastfeeding, although the chairs aren’t terribly comfortable. It would be great if some sofas or soft chairs were added so that there was a choice of seating. For those who have kids who can order from the menu, there are a few healthy options along the deep-fried stuff and sweets. The best choice is the Children’s Platter (£3.99), which offers either chicken, ham, or sausages accompanied by four different fruits and vegetables of your choice. They really do heap the fruits and vegetables on the plate, so your little one will get some good nutritious food into them. But there will always be the temptation of crisps, ice creams, and sweets, which are prominently on display. In total, Partyman World of Play gets a 6.75 out of 10 for baby- and toddler-friendliness. If it had nicer toilets and better lighting it would rate much higher, but even with these drawbacks it’s one of the best places to go with kids who need to play hard and shake their sillies out. Last week the Baberoo and I attended a session of Baby College, a baby and parent development course that includes physical, multi-sensory, and cognitive games and activities to enjoy together. Baby College runs classes in eight different areas of Oxford and the surrounding area. Note that this review is only for the session at St Anthony of Padua Church Hall in Headington/Marston (115 Headley Way, OX3 7SS); it doesn’t comment on any of the other venues or sessions. The name Baby College is somewhat tongue-in-cheek, but the course certainly boasts a varied curriculum. Each session includes movement, singing, exploration, and baby sign language, plus an emailed handout for parents to read which includes details of a different aspect of a baby’s development each week. It’s generally advisable to sign up for the full 12-week course (£72) because places are limited, but you can book a single session for £6.50 if there are spaces available. We signed up for a trial of the 9-18 month age group since the Baberoo is 10 months old (there’s also an infant session for 0-9 months and a junior session for 18 months-3 years). It was a real change for her to be in a group of babies older than her rather than the same age or younger. I think she might have felt a little daunted by the fact that everyone else was a proficient crawler, while she had only just learned how to crawl a few days before the class. However, she braved most of the activities, and particularly enjoyed the touch-and-feel cards, the parent-baby dancing, and the coloured balls. The session we attended focussed on textures, and I have found myself looking at and commenting on more textures at home with the Baberoo as a result – so clearly, it has had an impact! Unfortunately – and this is in no way the fault of the course content – the timing of the course had an unwelcome impact on the Baberoo’s naptimes (why, oh why, must all baby activities be scheduled during morning naptime?? ), which means that despite enjoying ourselves we’re going to be cutting down on attending most activities until the nap schedule has righted itself. How did Baby College rate for baby-friendliness? My ratings system for activities is on an 8-point scale, looking at space, ambiance, facilities, and feeding. For more about these, see my About page. 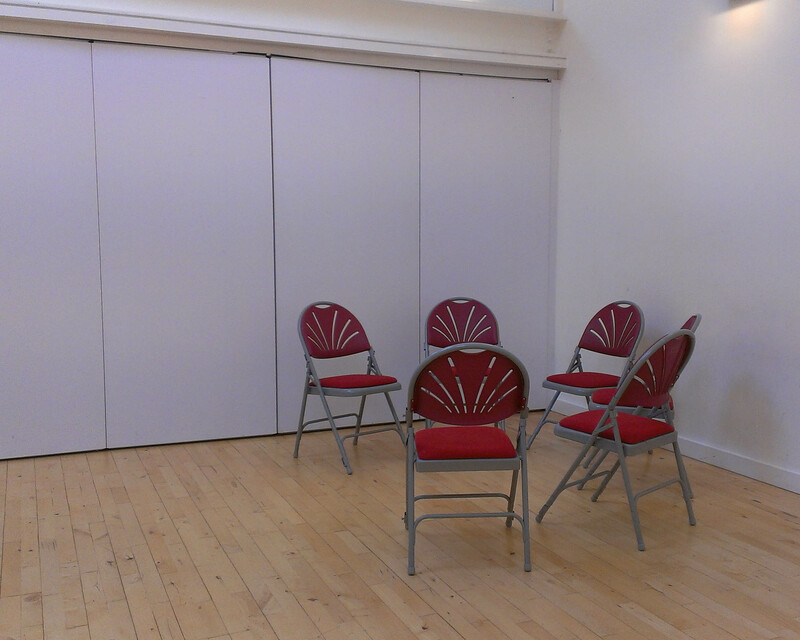 Space: The church hall at St Anthony’s is one huge room that is divided into two for the Baby College sessions. The outer area is a waiting room, with a few chairs and a table and plenty of room for parking your baby carriage. The classroom area is large enough to comfortably fit at least fifteen parents and their babies as well as the assortment of toys, objects, and props that are used in the classes. The high ceilings and large windows ensure a bright, well-lit area. But there’s not much in the way of interesting details in the building; it’s a very new-looking church hall and it’s somehow devoid of personality. Ambiance: Donna, our instructor (and one of the co-founders of Baby College Oxford), was very welcoming and led the session with aplomb, considering the chaos that can ensue when a dozen toddlers are presented with fun toys and objects to explore. The parents were friendly and welcomed us as newcomers. All the babies and parents were clearly aficionados of the course and had been attending for the whole term (we joined in on week 7 of 12). 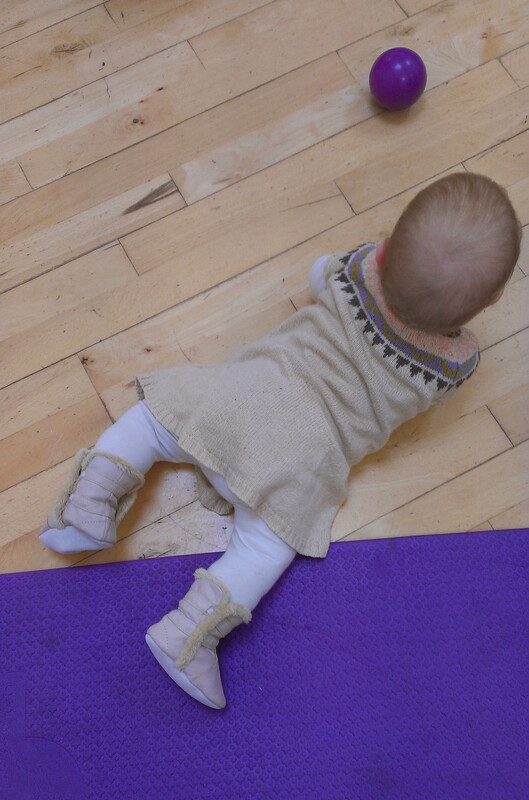 In general there was a lovely ambiance from the class attendees – especially the babies, who were really enjoying themselves. 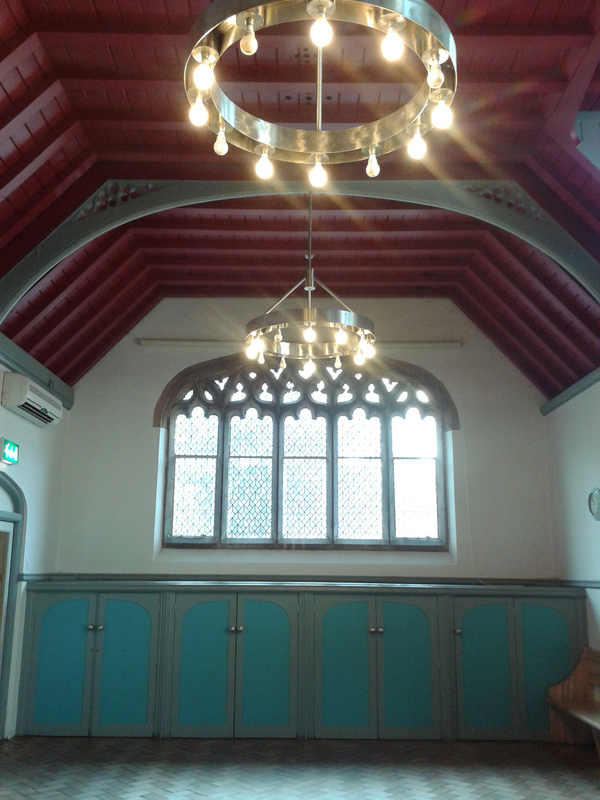 Facilities: Surprisingly, there are no baby-changing facilities in the church hall, just regular bathrooms – which is really a shame, and bad planning on the part of the building designers. 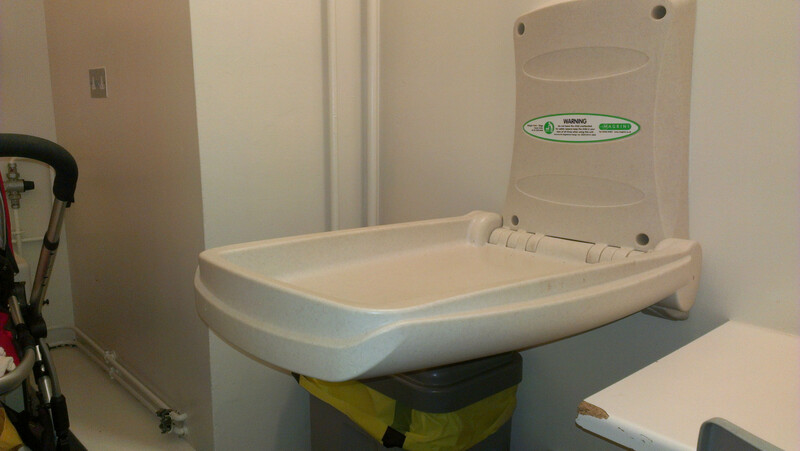 Parents can change their babies on the floor in the classroom or in the waiting area, and there’s also a table in the waiting area that can be used, but there isn’t a sink or garbage pail nearby so it’s not very useful if you have a major change to do. Feeding: If you’re breastfeeding you can sit on one of the chairs in the waiting area. We didn’t do a breastfeed on the day and I didn’t see anyone else using the room for that purpose, but I would have felt fine doing so, although perhaps it wouldn’t have been the most comfortable of seating. By my ratings system, the Baby College session at St Anthony’s in Headington/Marston scores a 5.5 out of 8 for baby-friendliness. It’s the venue’s lack of facilities, rather than the class content itself, that results in this score. The session itself was a pleasure, and when the Baberoo is back on track with her nap times I may venture back with her again. Lately I’ve been taking the Baberoo out to many more activities around Oxford, all designed for babies and their parents. 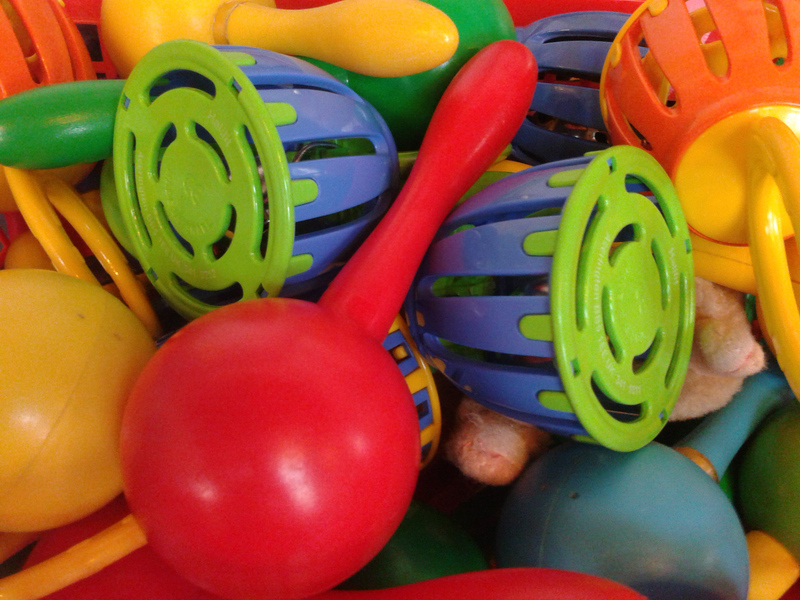 We have enjoyed Rhymetime at the Oxford Central Library (Westgate, OX1 1DJ) so much that we go almost every week. As a veteran attender of library activities myself (my mom started bringing me to storytime at the Ottawa public library when I was just a few months old), I was really looking forward to watching the Baberoo experience the reading-aloud and interactivity that I always loved so much. I’d already brought her to the library many times to borrow books, but I only started taking her to Rhymetime when she was about six months old. 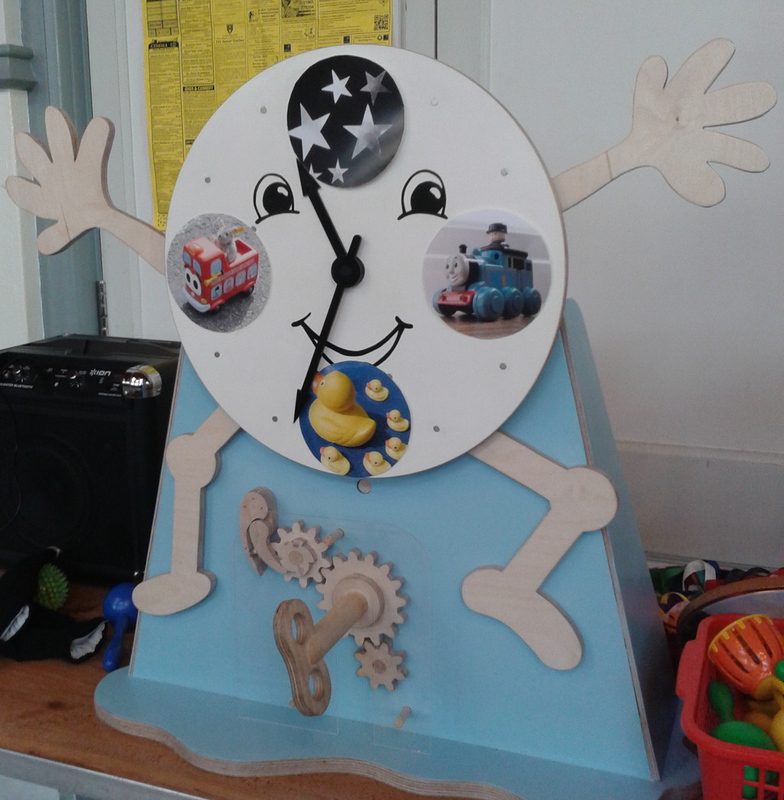 Rhymetime takes place twice a week at the Oxford Central Library, from 10:30-11:00 am on Wednesdays (led by two library staff members) and 10:30-11:00 am on Thursdays (led by volunteers), and is for children under 5 and their parents. The Baberoo was certainly not the youngest child there – I’ve met babies who were three months old when they came to their first session. Both sessions have the same content: rhymes and songs (but no storytelling), including some that have the kids shaking jingle bells and noisemakers, as well as playing with animal puppets. So how does Rhymetime rate for baby-friendliness? On this blog I’m rating all non-food-related activities on a scale of 8 points rather than my usual 10-point rating scale, since out of the five criteria (menu, space, ambiance, facilities, and feeding), there’s no menu. For a full explanation of my criteria see my About page. 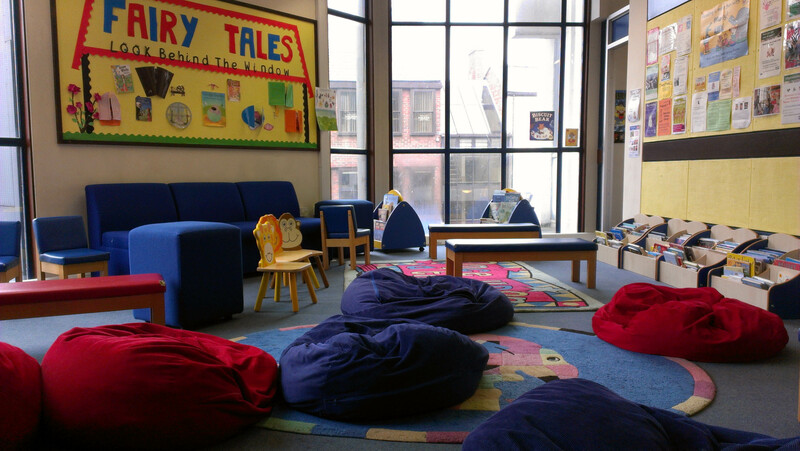 Space: Rhymetime takes place in the dedicated under-5s room in the children’s section of the library, which is spacious and well laid out. There are usually more than 25 children (plus 25 to 30 parents) at each session, so the room really fills up. The space has a lot of benches, beanbags, and chairs, but by the time everyone has squeezed in, it’s standing room only for latecomers. My suggestion is to arrive a bit early so you avoid the queue for the lifts, which can be quite long right before a session begins. Baby carriages can be parked within the other room of the children’s section. Ambiance: Colourful, interactive, and loud! The presenters are very welcoming and so are the other parents. It’s a fun environment and kids love to participate. In addition, each time we’ve attended I’ve noted how much the session is enjoyed by the presenters themselves. This is the kind of activity that keeps families coming back for more; there are many devoted regulars. Facilities: The Oxford Central Library has a baby-changing facility in the lobby outside the Children’s department; it requires an entry code, which is obtainable from any member of staff. It’s a serviceable room with a handy desk to put your bag on and a pull-down changing table. The room is long and narrow, which means you may not be able to reach the sink until you’ve put the changing table back up again. The way the room is laid out in relation to the regular toilets is somewhat awkward, so you need to make sure you have opened the exit door before you wheel your baby carriage into the tiny entrance space; otherwise you may find yourself stuck! Feeding: I have fed the Baberoo in the library (not actually during Rhymetime, but afterwards when the crowds have cleared) and can say that it’s a very welcoming space for breastfeeding. You also have your choice of seating (benches, chairs, or beanbags) so you can make yourself as comfortable as possible. Rhymetime at the Oxford Central Library scores a 7.25 out of 8 for baby-friendliness; it’s a fantastic activity and I urge any parent with children under 5 to try it out. We are now regulars!